At bat, Bailor choked up and held his hands slightly apart like Ty Cobb. He hit just nine home runs in 954 games, but his career average was .264 and he was a tough man to strike out, fanning in only 5% of his plate appearances in the majors. He liked to swing at the first pitch, though, so he also walked just 6% of the time. This and a suspect shoulder (not to mention the team’s tremendous depth) were among the reasons the Baltimore Orioles left him exposed in the 1976 expansion draft. The first original Blue Jay was a fan favorite in Toronto, managed in their minor-league system, and became first-base coach on the back-to-back World Series champions of 1992-93. As one might expect, Bailor (whose childhood nickname was “Buzz”) was a Pittsburgh Pirates fan as a boy. His favorite player was Roberto Clemente. In August 1963, Connellsville won the Pennsylvania state Little League title. In the final game against Levittown, Bob scored the game’s only run. “After we won the state championship, we played in the Eastern Regionals in New York,” he said in 2010. “We went on a plane, and we saw a Pirate game at the Polo Grounds.” He recalled correctly that it was the last season for the old stadium, and that the home team was one of his future clubs, the Mets. Oddly enough, Bailor did not play high school baseball. In part because of the area’s chilly spring weather, Connellsville High did not have a team, and neither did the school he wound up attending, Geibel Catholic High (also in Connellsville). Like his father, Bob was short and wiry. Nonetheless, he played halfback on a town football team and was a good basketball player, too. He still holds Geibel’s school record for most points in a game (47). “The American Legion competition was real good,” said Bailor in 2010. “That was the only baseball going at that time in that area. A couple of years we went to the Legion state championship and got close, but could never get over the hump.” One of his teammates was Bob Galasso, who pitched in the majors in 1977, 1979, and 1981. Another was a slugging first baseman named Jim Braxton, who became best known as O.J. Simpson’s blocking back with the Buffalo Bills in the NFL. After graduating, Bailor considered going to Gannon College in Erie, Pennsylvania, as a basketball player. He wound up enrolling in California State College – not any of the campuses in the Golden State’s system, but rather the school in California, Pennsylvania, near Pittsburgh. One reason he went to college was to escape going to Vietnam, since he had a low draft number. In August 1969, however, the Baltimore Orioles signed Bailor as a free agent. “I think I probably only weighed 140 pounds back then,” he explained. “I never got drafted – there were a couple of other guys on our Legion team that got drafted. Herman Welsh was the Legion coach and he probably played a big role in me getting signed. A scout for the Orioles, Jocko Collins, offered me a contract.” Collins, who also signed Bob Galasso for the Orioles that year, was able to get Bailor a modest $1,500 bonus. The teenager bought himself a 1964 Plymouth Valiant. In the summer of 1970, Bailor reported to his first minor-league club: Bluefield, West Virginia in the Appalachian Rookie League. It was about 250 miles straight down Interstate 79 from Connellsville. In 46 games he batted .273 with no homers and 8 RBIs. He also pitched in one game, allowing eight earned runs in just one inning. From 1971 through 1973, Bailor made steady progress through the lower levels of Baltimore’s chain. In 1971 he won the batting title in the Class A Northern League, hitting .340 with 2 homers and 50 RBIs in just 68 games for the Aberdeen Pheasants. In 1972, he was a California League All-Star with Lodi (.290-2-34 and a league-leading 63 steals in 129 games). In 1973, moving up to Double-A Asheville, he was a Southern League All-Star. He hit .293-0-29 in 115 games and was chosen as the league’s best hustler. He made it up to Triple-A Rochester for 17 games at the end of that season. In November 1973, the Baltimore Sun highlighted him as one of the organization’s 12 standout prospects. When that story came out, Bailor was getting his first experience of baseball overseas, as he went to play with Magallanes of the Venezuelan Winter League. It was a successful time, as he batted .318 in 54 games. On a sad note, though, Bailor watched on New Year’s Day 1974 as his roommate, pitcher Mark Weems, went for a swim but was swept out to sea and drowned. For three days, Bob, pitcher Don Hood, and Ray Miller (then a player-coach for Rochester) searched for the body so they could send it back to the Weems family for burial. “It made me realize how fragile life really is,” Bailor told Earl McRae. “We were kind of backed up when I started progressing through the farm system,” Bailor said in 2010. “I played the infield—all the infield positions—but they had Brooks Robinson and Mark Belanger and Bobby Grich, so Earl Weaver asked me to go out in the outfield and they had Don Buford, Paul Blair and all these Gold Glove outfielders, so it was tough. But you just had to keep grinding and try to make a name for yourself.” In addition to Belanger, a perennial Gold Glover, and Nordbrook, the Orioles had another major-league shortstop in their very deep system then, Kiko Garcia. At Rochester in 1975, Bailor hit .293-5-39 in 129 games, although he missed some time with a leg that became infected after a severe bruise. He was an International League All-Star, leading the circuit in hits (147), triples (6), and stolen bases (21). The Orioles called him up in September. He got into five games and went 1-for-7. “It was a big break,” Bailor recalled in 2010. “When the expansion draft came, it worked out perfect for me—granted we didn’t have good teams in Toronto early, but it gave me some exposure as far as other ball teams.” He also liked all the opportunities to fish and hunt in Ontario and elsewhere in Canada. Bailor finished the season hitting .310, best among all big-league rookies that year and still a record for expansion teams. That July, he said, “When I was leading the league for a while earlier in the season, I cut the averages out of the paper because I figured I’d never be ahead of Rod Carew again.” His five homers accounted for more than half his career total in the majors. The first of them came on April 16 at old Comiskey Park off Steve Stone of the Chicago White Sox. He struck out just 26 times (while drawing only 17 walks). Dennis Leonard of the Kansas City Royals said, “I struck him out five times on really tough pitches, sliders that were low and away. He rarely goes after a bad pitch. He’s an intelligent hitter, a good, scrappy player.” The Toronto baseball writers named him the Blue Jays’ player of the year. In 1978 Bailor posted a .264-1-52 batting line in a career-high 154 games and 676 plate appearances. He was playing primarily right field, as Toronto installed Luis Gómez at short, but also saw much action at third base and in center. The next year, however, still playing mainly right field, he slumped to .229-1-38 in 130 games. By that time, young Alfredo Griffin was Toronto’s shortstop. Things weren’t much better for Bailor in 1980 (.236-1-16 in 116 games). He missed nearly a month in June and July after suffering a broken wrist while hit by a pitch in an exhibition game against Toronto’s top farm club, Syracuse. That August, Bob made three relief pitching appearances for the Jays, all in games where they were trailing by several runs. The first two outings were scoreless, but he failed to retire a batter in the last and wound up with a 7.71 ERA. In his three seasons with the Mets, Bailor played mostly shortstop and second base, but he also filled in at third base and occasionally in the outfield. He missed the first three weeks of the 1981 season with a rib cage injury, and saw limited action during the remainder of the strike year (.284-0-8 in just 51 games and 95 at-bats). However, he was an “irregular regular” in both 1982 (.277-0-31 in 110 games) and 1983 (.250-1-30 in 118 games). Bailor came up with a number of key late-inning plays while he was a Met. One memorable performance came at Riverfront Stadium in Cincinnati on August 23, 1981. He knocked in the winning run with a sacrifice fly in the tenth inning, then after moving to left field, ended the game with a leaping, over-the shoulder catch of George Foster’s long drive. George Bamberger, who managed the Mets in 1982, loved Bailor. That August Bamberger said, “Who on this club could be having a better year than him? I’d have to say he’s the most valuable player on the club at this moment. He’s just done so much.... He can do so many things.” Teammate Hubie Brooks, then a second-year player, said of his fellow infielder, “A lot of times when I’m not sure of something, I go to him.” Bailor’s versatility and “heady game” also won him praise from rival managers such as Pittsburgh’s Chuck Tanner. In 2010 Bailor joked, “I went from New York City to LA – I felt like Jed Clampett going out there. [Tom] Lasorda was good to play for – he let you do your own thing and had a lot of enthusiasm and kept you pumped up all the time.” Not long after the trade, Bailor remarked that he didn’t like to be called a utilityman. “That makes it sound like I change light bulbs for a living,” he said. He had a chance to win the starting shortstop job for the Dodgers, but in spring training 1984, he dislocated his left shoulder diving for a ground ball. He did not come back until early May, went on the DL again in August, and got into just 65 games overall (.275-0-8). Davey Johnson and Frank Cashen still liked Bailor. In Bats, a chronicle of the 1985 season, Johnson wrote that Cashen got excited because Dodgers GM Al Campanis had said that he was willing to make a deal. Johnson said, “Bailor would be the perfect right-handed bat. What do they want for him?” The asking price was a top prospect, though, and it turned the Mets off from dealing with Campanis. In 1985, Bob started the season on the DL again and landed there once more in June. He went .246-0-7 in 74 games, but he finally got a taste of the postseason as Los Angeles lost the NL Championship Series to the St. Louis Cardinals. He appeared in two games and was hitless in his only plate appearance. He then spent four seasons as Syracuse’s skipper. The Chiefs finished first in the International League in 1989 but lost the Governor’s Cup playoff finals to the Richmond Braves. Of greater interest that year, though, was how close Bailor came to being manager of the big club. After Jimy Williams was fired in May, the Buffalo News wrote, “The Toronto Blue Jays’ brass is said to be divided evenly between interim manager Cito Gaston and Syracuse manager Bob Bailor as the permanent replacement.” When Gaston’s interim tag was removed, though, it came as a relief to Bailor because the speculation had ended. Toronto finally did bring the first Blue Jay back to the big leagues in November 1991, naming him first-base coach. When the club won the World Series for the first time in 1992, he said, “I’ve gone from walking in snow to walking in champagne,” (a reference to Toronto’s first game ever, played with snow on the Exhibition Stadium field). That winter, the press called him a dark-horse candidate for the opening with the Texas Rangers, but that job went instead to Kevin Kennedy. In subsequent years, the Toronto press noted that the Blue Jays had groomed Bailor as Gaston’s eventual successor. 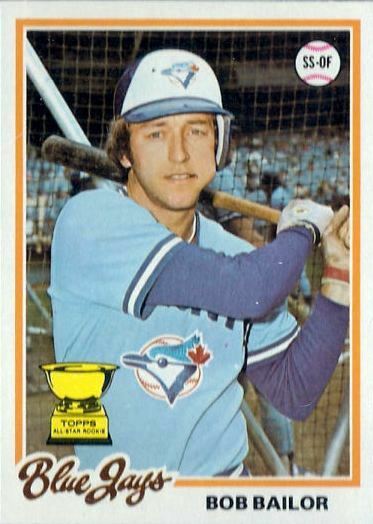 Bob served as first-base coach through 1995; in June of that year, he was still described as a “manager-in-waiting.” The Blue Jays sacked all of Gaston’s coaches after the season, though, and did not offer Bailor another job in the organization. He was still without a job in baseball in early 1996. He soon retired and didn’t look back. Vecchio, Valerie. “Bailor of Connellsville.” Syracuse Post-Standard: February 5, 1988: B1, B4. Vecchio, Valerie. “Bailor of Connellsville.” Syracuse Post-Standard: February 5, 1988: B1. Preston, Joseph G. Major League Baseball in the 1970s. Jefferson, North Carolina: McFarland & Co., 2004: 223. Kaplan, Jim. “I'll Tell You What–This Guy Can Hit.” Sports Illustrated, May 22, 1978. “Connellsville Cops State Title.” Associated Press, August 11, 1963. Black, Jason, “Hall of Fame induction thrills Bailor.” Connellsville (Pennsylvania) Daily Courier, June 23, 2010. On a side note, the team that defeated Connellsville in the regional final, Stratford, Connecticut, was national runner-up that year. McRae, op. cit. Black, op. cit. Von Benko, George. “Chemistry carried 1989 Connellsville baseball team.” Uniontown Herald-Standard, April 5, 2011. “League Top Hitter Needs Fans Votes.” Associated Press, July 1, 1977. Heufelder, Bill. “No Blue With Jays.” Pittsburgh Press, June 29, 1977. “Two Named Loop’s Best.” Associated Press, August 22, 1973. Hatter, Lou. “12 Oriole farm prospects stand out.” Baltimore Sun, November 14, 1973: C3. McRae, op. cit. Venezuelan baseball author and SABR member Alfonso Tusa states from personal recollection that the date of Weems’ death was January 1, 1974, although some American newspaper accounts at the time suggested that it was two days earlier. However, Ray Miller also remembered it as New Year’s Day in at least one article. See Boswell, Thomas. “Miller’s Winding Road.” Washington Post, November 15, 1997. Bennett, Brian. On a Silver Diamond: The Story of Rochester Community Baseball from 1956-1996. Scottsville, New York: Triphammer Publishing, 1997: chapter 4. Bennett, op. cit., loc. cit. Halvonik, Steve. “Mets’ Best Player? Versatile Bob Bailor.” Pittsburgh Press, August 9, 1982: C-5. Vecchio, op. cit., loc. cit. Elliott, Bob. “Bailor doesn’t hate Jays.” Toronto Sun, June 30, 2010. Johnson, Davey and Peter Golenbock. Bats. New York, NY, G.P. Putnam, 1986: 37. Edes, Gordon. “Bailor May Become Dodger Shortstop, Campanis says.” Los Angeles Times, December 17, 1983. “Proud Papa Has a New Worry.” Daily News of Los Angeles, March 26, 1986. “Jays sign Bailor to one-year deal.” Toronto Globe and Mail, October 10, 1986. Vecchio, op. cit., loc. cit. Proudfoot, Jim. “Bailor surprised to be a Jay again.” Toronto Star, March 11, 1992: C4. Felser, Larry. “Successor to Williams Divides Blue Jay Brass.” Buffalo News, May 15, 1989. MacCarl, Neil. “Gaston gets praise from losers in race for job with Jays.” Toronto Star, June 1, 1989. Henneman, Jim. “Jays’ Bailor sees the best and worst of times.” Baltimore Sun, October 26, 1992: 3C. Milton, Steve. “Gaston hangs tough at Jays helm.” The Spectator (Hamilton, Ontario), June 28, 1995.